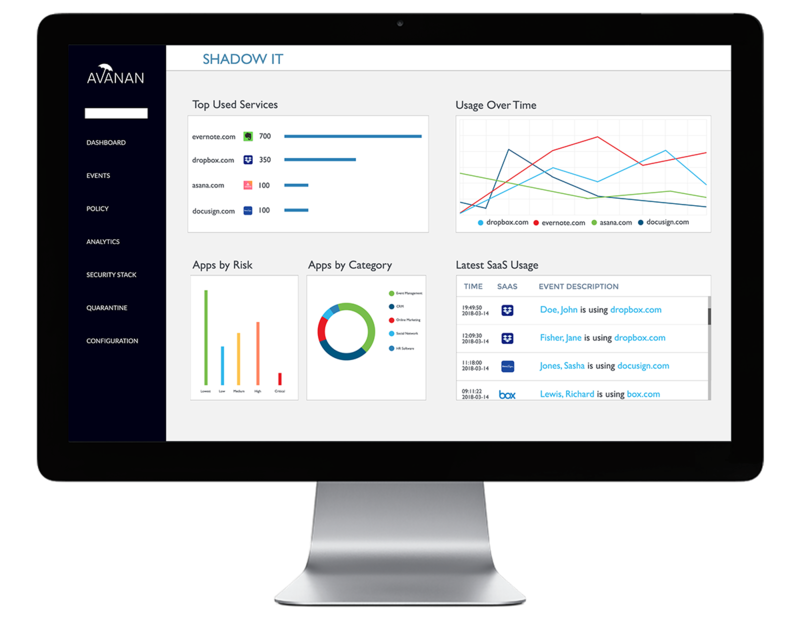 Avanan monitors Shadow IT and Shadow SaaS to identify unapproved cloud applications and API connections, without the need to reroute traffic through a proxy or install an additional appliance. Avanan connects to your existing firewall to monitor all outbound traffic for unapproved SaaS applications and captures data from your DNS, DNS management systems or perimeter gateways via API to capture real-time web activity. Avanan connects to approved SaaS and IaaS providers to monitor third-party applications that users might connect to their accounts, with visbility into the the level of access the user has provided. 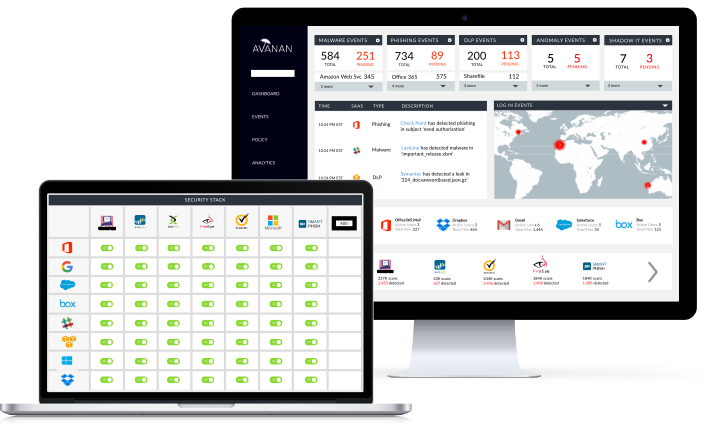 Avanan captures real-time and historical information about every user, file, configuration, and permissions event. Avanan gauges risk for each Shadow IT/SaaS connection, including the level of access each service might request—for example, read-only access versus read-write access to email. In collaboration with the industry's leading security vendors, Avanan's platform offers an arsenal of data security solutions, with a full suite of granular policy-enforcement tools to protect critical data. Avanan's SmartSearch tools use OCR to flag personally identifiable information (PII) and other confidential text within every file, email, or message. Avanan configures granular file permissions that consider the role of the user and the confidentiality of the data they are attempting to access. Avanan simplifies encryption deployment across the cloud environment using role-based, context-aware policies that eliminate the need to encrypt everything, but ensure data security even after files leave the cloud. Avanan provides complete defense-in-depth security for users and data within cloud applications—from email and messaging, to file sharing and IaaS. Avanan’s suite of email protection tools engages advanced machine learning, behavior analytics, dynamic sandboxing, historical and real-time analysis, and the technology of the security industry’s most recognized vendors. 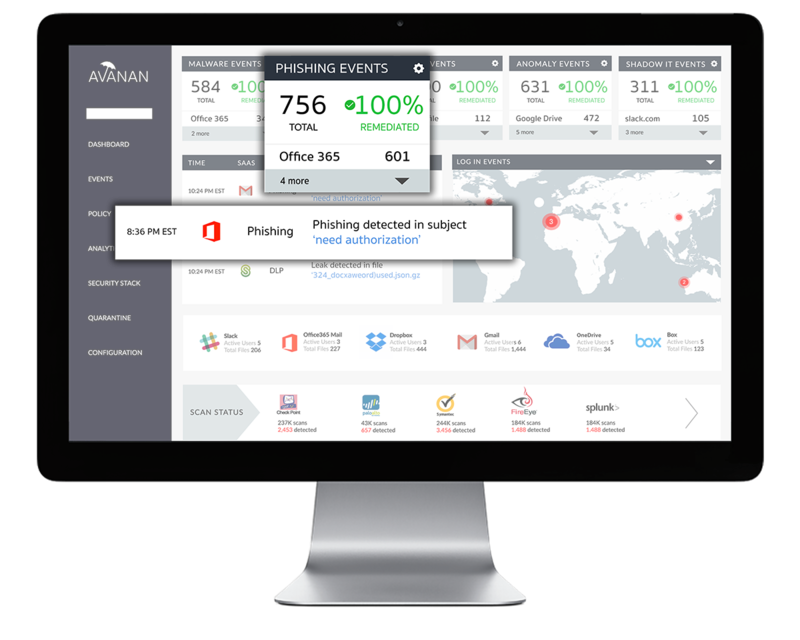 Avanan monitors every user event to remediate anomalous behavior, permission violations, and misconfiguration or malconfiguration changes that indicate a compromised account. Avanan's next-generation tools identify zero-day exploits real-time, without the delay of emulation. 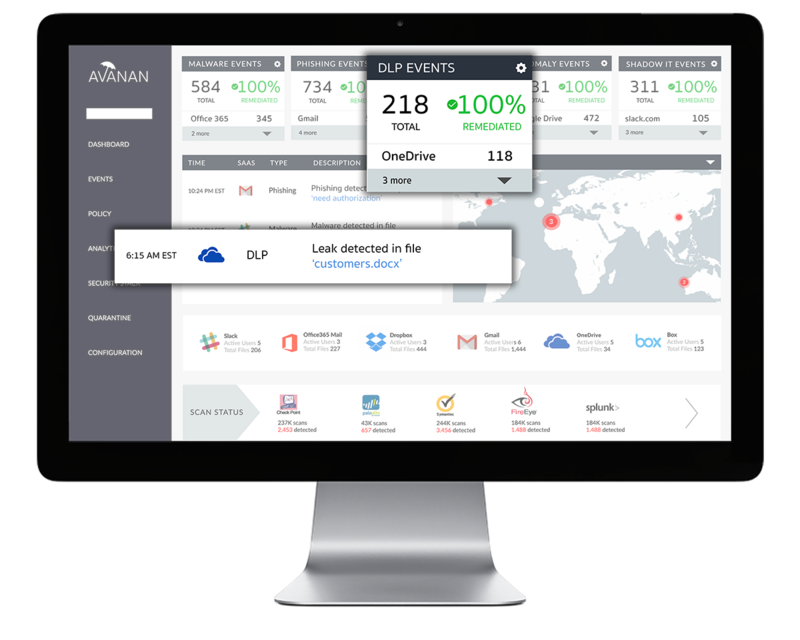 Avanan scans every email, file, and chat message for malicious links, leveraging several blacklist databases. Avanan analyzes every email and file for malicious code before it reaches users. Avanan emulates suspicious files to prevent zero-day threats. Avanan’s universal cloud auditing tools give you a detailed view of what’s occurring in your cloud environment so you can create policies and remediate. Avanan continuously collects and correlates user, file, and configuration events to each cloud provider and security tool, streaming them to an organization's existing reporting infrastructure. Avanan instantly amasses historical event data for retrospective compliance auditing and real-time reporting. Avanan enforces compliance for every industry, from GDPR and SOX, to PCI and HIPAA. Avanan's agile policy engine moves and encrypts files, changes permissions, filters messages, and leverages cloud-native tools to ensure compliance. 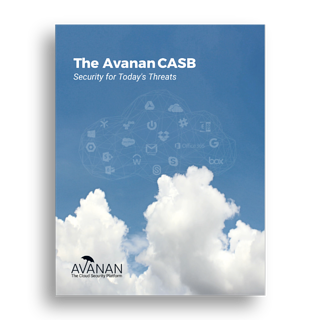 Start a 2-week trial of the Avanan CASB, with the option to add more security and extend to additional SaaS from within the trial.